Expert Option is one of the new Cyprus-based binary options online brokers, but comes with a difference. Expert Option not only awards a deposit bonus of between 25% and 125% for all first-time deposits, but also awards a “re-deposit” bonus. So if you have a dormant account, you can get extra trading capital by simply making a new deposit to reactivate your account. Additionally you can trade over 100 assets and take advantage of a $10,000 demo account to test drive the company. Try social trading and use the platform on any device. Expert Option currently has over 3 million users. Find out more about Expert Option below. Expert Option is a Cypriot-based binary options online broker, and winner of the Best Trading Platform award at the China Forex Expo held in Shenzhen on 6-7 May 2017. The company commenced operations in 2014 and is gradually emerging as a force to be reckoned with among binary options online providers. Expert Option is regulated and licensed by the Vanuatu Financial Services Commission (VFSC). Forex: USDCHF, EURUSD, USDNOK, AUDCAD, AUDUSD, EURGBP, USDJPY, CHFJPY, USDCAD, GBPUSD, USDTRY, USDCNH, and EURJPY. Indices: GER30, Dow30, S&P500, Nasdaq100, FTSE100. Stocks: Apple, Allergant, Amazon, Alibaba, Baidu, Coca Cola, CitiGroup, Facebook, Ford, Disney, Goldman Sachs, Google, IBM, Lockheed, McDonald’s, Microsoft, Netflix, Tesla, Yahoo!, Weibo and YUM. Cryptocurrencies: Bitcoin (BTC), Litecoin (LTC). Mini Account: Bonus award of 50%. Silver account: 80% bonus award. Gold account: The gold account delivers a 100% bonus. VIP account holders get a 125% deposit bonus. The VIP bonus is an exclusive bonus which comes with a lot of extras such as very fast withdrawals and supreme account management. Perhaps what Expert Option is known for, and what sets it apart from its peers, is the “re-deposits” bonus. The re-deposit bonus is awarded to old traders of Expert Option who renew their commitment to trading again by depositing more funds into their accounts. The re-deposit bonus starts at 25%, but further increases can be negotiated. All bonuses are subject to trade turnover requirements before any withdrawals can be made. Expert Option boasts of one of the most advanced mobile trading apps available. 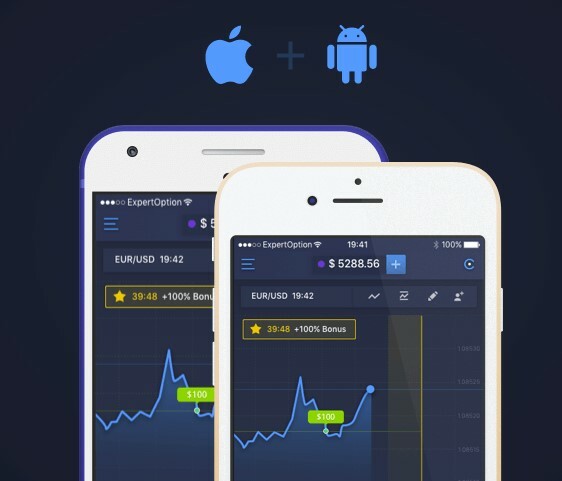 Traders have access to the iOS and Android versions of the Expert Option mobile trading app. Credit card/debit card: Deposit and withdraw with your VISA, MasterCard, VISA Electron and China UnionPay branded cards. Transactions are instantly processed to enable you start trading immediately. Bank wires are available for those traders who do not have access to credit cards or digital wallets. Transactions take 3-7 days to complete. Digital wallets: Several digital wallets are accepted on Expert Option and they include Neteller, Skrill, Yandex Money, Payweb, AliPay, WebMoney, and China UnionPay. GiroPay, and QiWi are also accepted, as well as Sofort. Transactions are instantly processed and traders can actually withdraw as small as $10, allowing them to take profits in small amounts and amass it for a great payout. The transaction processing times of Expert Option is comparable to what is obtainable in the industry. Live chat facility which is available 24/7, 5 days a week. Email: Use the email address [email protected] to reach the Expert Option team. Phone: Call the dedicated phone number at +44 20 3868 3160. Agents that speak the listed languages above are available to take your requests. The quality of the customer support on ExpertOption is very good. A $10,000 demo account is available for all traders. There is a fully functional educational suite which provides a compendium of technical analyses and trading strategies. Expert Option provides an affiliate program which enables users to refer their friends and get paid doing so. Never miss your favourite trade, and avoid staying on the charts all day with the Asset Schedule. The Asset Schedule presents the best trading times for your favourite asset. Interested in catching up with the cryptocurrency trade? Trade Bitcoin and Litecoin on the Expert Option platform. 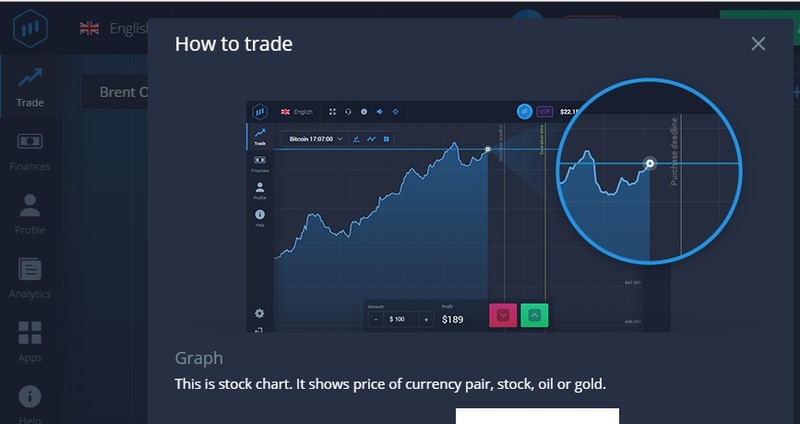 Expert Option may have only been in the market for 3 years, but it is slowly but surely finding its way into the hearts of many binary options online traders across 150 countries of the globe. The company has incorporated a lot of user-friendly features into its offering, ensuring that the trader is placed first. Here are some of the advantages of using Expert Option as your preferred binary options online broker. The Social trading feature allows traders to watch deals and follow the markets across the globe, all as a group. Over 100 assets including popular stocks like Apple, Facebook and McDonald’s, with plans to add more assets in the future. Re-deposit bonuses provide an added incentive to trade. Desktop application of the Expert Option platform is available for both Mac and Windows users. No more discrimination against Mac users when it comes to trading software! Perhaps the only issue that Expert Option faces is that it is regulated by one of the lesser entities in the market as far as regulatory bodies are concerned. Expert Option may need to get licensing from some of the better-recognized regulatory bodies to strengthen its foothold in the market. Is Expert Option a trusted broker? Expert Option is one of the trusted brokers in the binary options online market. The company is regulated by the VFSC and there are no pending cases against it. What is the minimum deposit amount on Expert Option? The minimum deposit amount on Expert Option is $50, which is the amount that can be deposited on the Mini account as the minimum. Other account types come with minimum deposits as well: $250 for the Silver account, $1000 for the Gold account and $2500 for the VIP account. What are the platform versions available on Expert Option? You can trade with the following Expert Option platforms: a browser version, a downloadable desktop version as well as a mobile app. Is Expert Option a scam or legit? Expert Option is a legit broker. There are no scam reports against the company. Can I trade Bitcoin on Expert Option? Yes, you can. Bitcoin is one of the assets that you can trade on the Expert Option platform. The essence of the bonuses is to provide extra trading capital. To be able to withdraw it, you have to fulfill the trade turnover conditions attached to the bonus. Refer to the Bonus Conditions document on the Expert Option website.